Kim Su-yeon, a 21 year-old student from Dankook University, is on a diet almost every day in hopes of achieving her ideal figure. ``To be able to wear clothes well, the X-line is the perfect shape. But to show off the body, the S-line is better... I think thin people look really ill, and it doesn't look good,'' Kim said. Nowadays, many female college students like Kim are always trying to go on a diet and exercising their way to a slimmer body. Three out of four female college students consider X-line, a term referring to a slim waist with ample breasts and hips, to be the ideal body shape, according to a survey by Amore Pacific's V=B Program. The survey covered 1,000 female college students from Ewha Woman's University and Dongduk Women's University from May 13 and 17. A majority or 75 percent of the female students preferred a balanced body characterized by a slim waist and flat abdomen. Only 12 percent of respondents wanted to have the reed-thin figure most commonly identified with fashion models. The S-line, which refers to the shapely profile of a woman's body created by breasts and buttocks, was not mentioned in the survey. ``In the past, being thin was popular for female students. But now they are focusing on having a balanced body, with a small waist and flat abs. They also now prefer a healthy diet, as seen in the survey results,'' a public relations manager for the V=B program said. When it comes to preferred mode of dieting, 65 percent of the respondents said they combine exercise with health supplements. Only 2 percent said they engage in ``unconditional fasting,'' and 1 percent said they take herbal medicine, as part of their diet plan. The survey also showed female students focused on reducing their thighs (32 percent), abdominals and lower back (26 percent), when they are on a diet. Around 19 percent answered they wanted to reduce their hips, while 15 percent said they wanted to focus on the overall body shape. The survey results were taken as a sign of how Korean women's body image is changing. ``They're now shunning the thin model ideal, in line with recent changes in the fashion world. Now their ideal body and diet plan are becoming more mature and developed,'' the V=B public relations representative said. The X-line is fast becoming an ideal among young coeds this year, but last year it was the S-line that gained popularity. Singer and actress Son Dam-bi was considered the ultimate S-line icon and endorsed a tea drink that promised a slim ``bellyline'' like hers. These ideal body types perpetuated by the media have placed more pressure on young women to go on a diet and lose weight, sometimes to the detriment of their health. Na Yoo-jin, a 22 year old student from Ohio State University, tried going on a diet last year but had to give up because she became sick. ``Nowadays, I think people just want to be really tall and thin. I feel envious when looking at thin women, but I still want a body with a little muscle and some volume ― a healthy body,'' Na said. Right now, she engages in exercise, such as running or cycling, and eats less for dinner. The Korean penchant for naming female body types after letters in the English alphabet has only seemed to encourage an unhealthy body image for young women. Aside from the S-line and X-line, other widely-used terms include V-line, referring to a slim V-shaped face; and U-line, referring to the exposed lower back. ``These `lines' add to the message to young Korean women that they will overwhelmingly be judged on their appearance rather than on their skills and ability. It does not seem unreasonable to make a connection between that and surveys that find that the vast majority of Korean women believe that they are too fat, when in fact they are the slimmest in the OECD,'' Turnbull told The Korea Times. 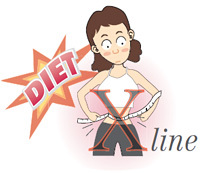 Many companies continue to use the S-line and X-line concepts when pitching new products, such as diet drinks, fat-free snacks, low-calorie beer, weight loss supplements and slimming creams, to female consumers. Amore Pacific's V=B Program, which sponsored the survey of college students, offers a line of herbal Oriental beauty supplements. It recently introduced the ``S-line slim DX,'' which claims to reduce body fat and abdominal fat. Another cosmetics company Missha recently introduced the ``Cool Fitting Body Gel,'' designed to help women achieve a contoured body, in time for summer. ``Companies do have a vested interest in creating new, artificial body ideals that purchasing their products can supposedly help you achieve. And given the media's overwhelmingly uncritical reporting and active dissemination of these ideals, then it is difficult not to conclude that the media is at least passively colluding with its advertisers in this regard,'' Turnbull said.